Some misguided men think more about the end of the world than the end of their lives, even though it is obvious that for him to whom the end of his life comes the end of the world has come. A brother standing before St. Seraphim of Sarov continually kept in his mind how he was going to ask the Saint about the end of the world. St. Seraphim discerned his thought and said to him: "My joy! You think highly of the wretched Seraphim. 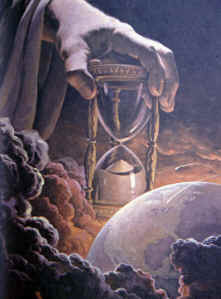 How could I know when the end of the world will be, and when that great day when the Lord will judge the living and the dead and render to each one according to his deeds will be? No, no, this is impossible for me to know!" And when the saints did not know, how will the sinners know? Why should we know that which the Savior Himself did not find beneficial to reveal to us? It is much better to think that our death will come sooner than the end of the world rather than the end of the world before our death.